Apps like Foodspotting, which let you share what you eat are all well and good, but what about the health implications of all that grub? That’s where Foodzy comes in. Foodzy describes itself as a ‘social food game’ for iPhone and Android, with an emphasis on health. 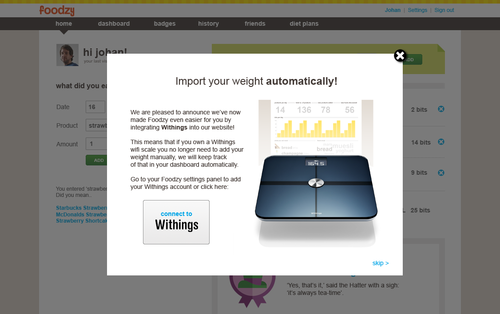 Today, it’s been updated with new features to better let you track just how your diet’s affecting you. Amsterdam-based Foodzy gamifies your food intake by rewarding badges for healthy choices, and even marking some more ‘fun’ events like a Hangover badge if you drink too much. We covered the apps as part of the London AppCircus event last week. If you’re a paid-up Pro user of the service, today’s update gives you a personal dashboard showing daily stats for calories consumed, the amount of fluids you drank, your favorite food and all time high scores for your weekly calorie and drink intake. The app can even track your weight through integration with the Withings Scale, an Internet-connected device that measures your weight, fat mass and body mass (BMI). You can enter your weight manually if you don’t have the Scale. 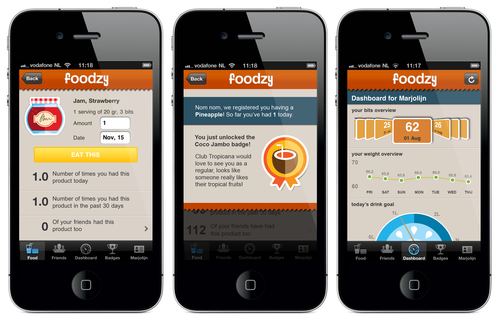 The goal here seems to be to make Foodzy a food-focused version of fitness-tracking apps like RunKeeper and Endomondo. Similar to Endomondo’s approach, Foodzy has also unveiled a new ‘lite’ version that can be used for free. This includes basic functionality but lacks the health dashboard and hardware integration. Pro accounts cost a nominal $15 per year, making it a pretty painless upgrade. Since its launch in July, Foodzy’s mostly crowdsourced database of foods information has grown from 50,000 to over 150,000 food products. For the future, further integrations with hardware are planned – FitBit and Jawbone UP are both on the roadmap.